Do you know a recent graduate who would make a great leadership consultant? academic year. The positions will begin in July 2019 with training at national headquarters in Indianapolis, IN. Leadership consultants travel across the U.S. from August to April providing leadership training and educational programming to Alpha Sigma Alpha collegiate women. 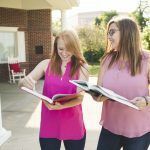 Before hitting the road, these women receive intensive training that covers everything from Alpha Sigma Alpha’s recruitment philosophy to how to mentor a member. Applications are due January 10, 2019. Alpha Sigma Alpha is now accepting applications for leadership consultants to travel for the 2019-20 academic year. The positions will begin in July 2019 with training at national headquarters in Indianapolis, IN.